Bothered with annoying backgrounds or watermarks in a PDF file? You can use SoftOrbits PDF Logo Remover to clean them up easily with just a few clicks! PDF Logo Remover offers an easy way to remove watermark from PDF files. The tool offers a quick, simple way to remove embedded images from PDF files without affecting files' visual quality whatsoever. Remove annoying watermarks and clean busy backgrounds, saving toner or ink when printing multi-page documents! Unwanted images and busy backgrounds can make PDF files difficult to read, reducing perceived contrast and creating unnecessary clutter. Removing the watermarks and cleaning up backgrounds can really improve reading experience, especially on tablets and mobile PDF reading devices. Documents with dark, busy background are not only difficult to read, but consume extra toner or ink to print. Clean up PDF files and save toner and ink - an economy of up to 90% in extreme cases! PDF Logo Remover offers convenient batch mode, allowing you to clean up multiple documents bearing the same watermark image. You can remove any type of images from PDF files, not just watermarks. With PDF Logo Remover, you can clean up logotypes, background images, header and footer images, or any other type of embedded pictures. PDF watermark remover works without affecting the quality of the original PDF document, offering completely lossless watermark removal no matter how many images you have to clean up. The original formatting will be fully preserved sans any images you want to remove. In addition to removing watermarks from PDF files, PDF Logo Remover can help you embed your own images, logos and watermarks into PDF documents. Watermark PDF files with ease! 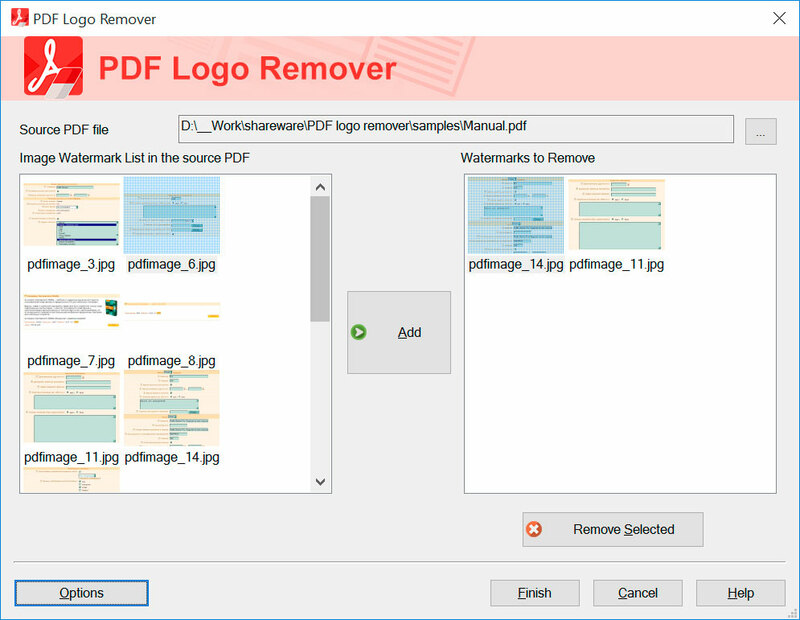 Simply select the document, specify watermark image, and choose its appearance in PDF Logo Remover - and the tool will do the rest automatically. Try to remove watermark from PDF for free! Download the free evaluation version and see how PDF Logo Remover can improve your reading and printing experience in just minutes.